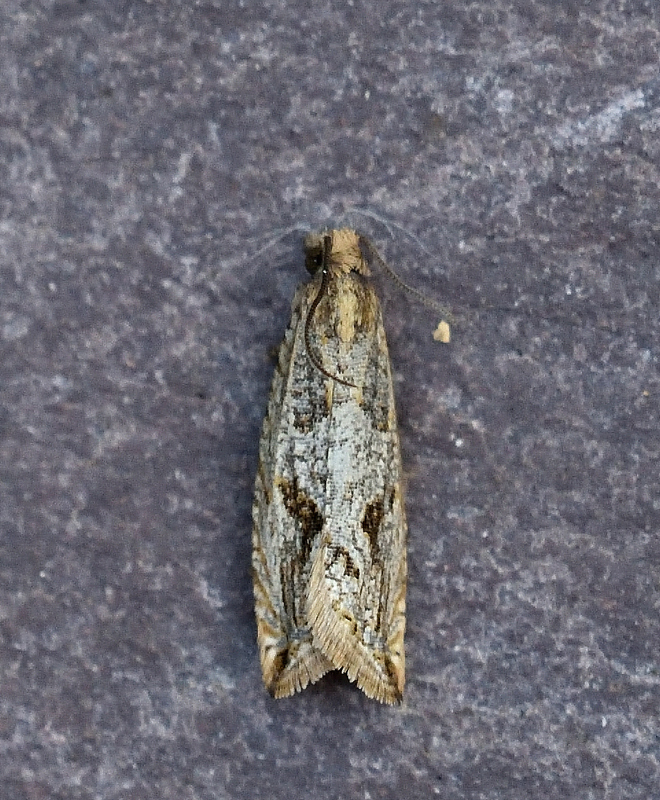 I found a rather flat Tortrix in the conservatory, which had probably slipped out of the trap. It's a small micro and I did not realise it was a Tortrix until I had photographed it and looked at the picture at a large scale. 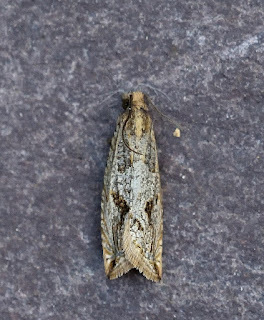 After looking at the book and doing some googling, I have come to the conclusion that this is Bactra lacteana - I hesitate because I realise this is a very local species - and isn't on my Carms template. 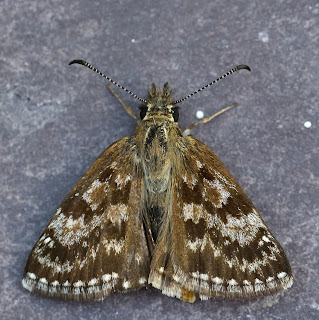 I also caught a Dingy Skipper in the conservatory which is my 20th Butterfly species in the garden and I think my first in July. Your Bactra does look good for lacteana with its prominent apical streak, Adam, but it would be interesting to hear Sam's view, all the literature seems to say that gen det is needed to confirm, and it would be a new one for Carms unless it's been recorded since 2016. Excellent photos again, as a matter of interest (or curiosity!) do you use a SLR, compact or a 'bridge' type? I use a Nikon D7200 DSLR with a Sigma 150 macro lens. It's an effective combination but macro lenses have some curious characteristics which I still have not fully mastered. That explains the high quality of your images, Adam. I use an Olympus TG-4 Compact which has an excellent macro facility but can't compete with the Sigma 150. 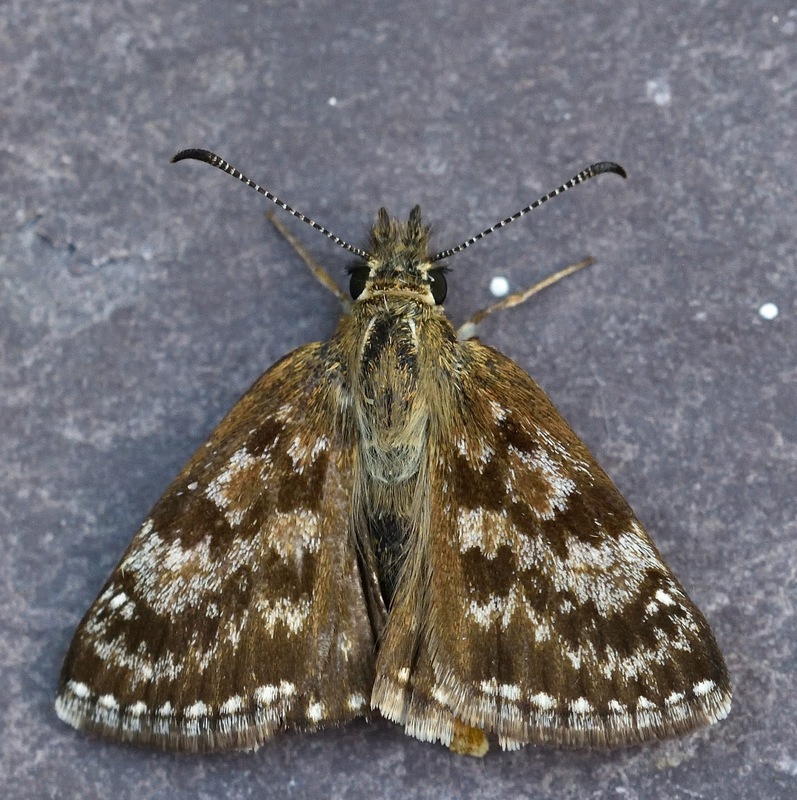 My wife has a Canon 450D and I toyed with the idea of getting the Sigma macro lens for it, but the combination would weigh at least 5 times as much as the TG-4 (250g) and I would have to rig up a permanent tripod arrangement, which isn't practicable in the room where I off-load the moths. Thanks for the info anyway, it's always interesting to know how others manage things in the continuous effort to improve my own practices. If it's "flat" does that mean it died in the trap? Without gen. det. it's not going to be addable to the VC44 list, even though it looks like a good candidate for B lacteana, but if there's a specimen then I'd be happy to take a look. Not dead, I mean that it's profile didn't immediately make me think it was a Tortrix. I let it go once I had a decent shot. It's a pleasure to talk about cameras Chris!